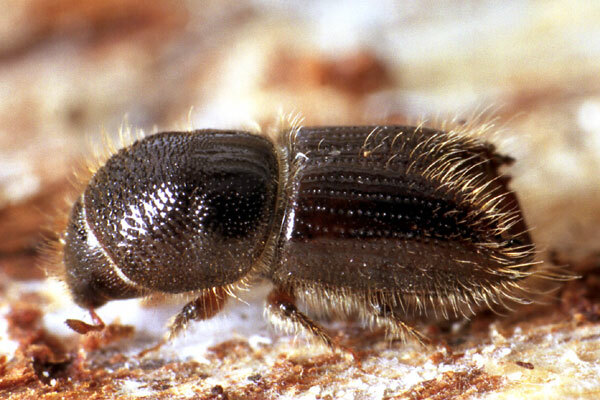 European spruce bark beetle Ips typographus, photographed by D. I. Gavryushin. Ips is a genus of bark beetles native to Eurasia, north Africa and North America, with at least one species introduced to Australia. Species of this genus are phloeophagous and heterosanguineously polygynous (Wood 1986). Characters (from Wood 1986): Body length 2.1–6.9 mm. Antennal club flattened, sutures moderately to strongly bisinuate (occasionally procurved); eye small, finely faceted, sinuate on anterior margin, its width equal to much less than length of scape, its length equal to much less than twice length of scape; elytral declivity broadly, rather deeply excavated, margins acutely elevated and armed by three or more pairs of denticles, third pair on or incorporated into crest of lateral margin, lower margin of declivity rounded. [JKW03] Jacobs, K., T. Kirisits & M. J. Wingfield. 2003. Taxonomic re-evaluation of three related species of Graphium, based on morphology, ecology and phylogeny. Mycologia 95 (4): 714-727. [SC04] Stone, C., & N. C. Coops. 2004. Assessment and monitoring of damage from insects in Australian eucalypt forests and commercial plantations. Australian Journal of Entomology 43 (3): 283-292. [W86] Wood, S. L. 1986. A reclassification of the genera of Scolytidae (Coleoptera). Great Basin Naturalist Memoirs 10: 1-126.